SALAMANCA – Bryan Barnes, 50, of 28 Chestnut St, died Friday, March 18, 2016 at the Olean General Hospital following a courageous battle with cancer. Born September 5, 1965 in McKinney, TX, he was the son of the late James and Rheda Hall Barnes. He grew up in Waco, TX and worked in construction, specializing in interior flooring, and was known to be a hard working man. Bryan was a loving husband, father, and grandfather. He and his wife, Dorothy Tracy Barnes were married August 31, 2007 in Waco, TX. 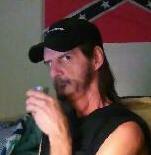 He enjoyed watching NASCAR racing and listening to country and classic rock music. He was a fan of the Dallas Cowboys. Surviving are: two daughters, Rebecca (Kris) Schneeberger of Steamburg, Tiffany Barnes-McMillan of HI; four grandchildren, Mark Burdick, Jonathan Schneeberger, Nathan Schneeberger, all of Steamburg, Madeline McMillan of HI; and a great-grandson, Phoenix Fire Lee Burdick of Steamburg; two brothers, Keith and Anthony Barnes; two sisters, Wendy Barnes and Elizabeth (Carl) Walker; several nieces and nephews. In addition to his parents, he was also preceded in death by a brother, Gregory Barnes. Bryan granted the gift of sight by donating his eyes. At the request of the deceased, there will be no visitation or services.